Obituary for Marie (Marité) Therese Langlois | Heubner Funeral Home Barry's Bay Ltd.
Marie Therese (Marite) Langlois, staff worker of Madonna House, died peacefully on Saturday, March 23, 2019 in Our Lady of the Visitation, St. Mary’s, Combermere, ON. Marite, daughter of Eugene Jean and M. Cecily McDonnell Langlois, was born in Westmount, Quebec. She attended St. Paul’s Academy in Westmount, the Convent of the Sacred Heart in Montreal, and continued studies at McGill University, Montreal. She first visited Madonna House in December 1950 and made her first promises as a member of the Community on May 3, 1952. 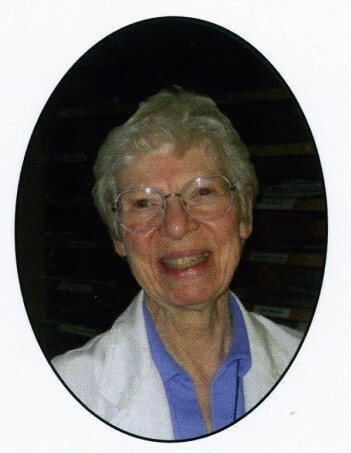 Marite served at Marian Centre, Edmonton, and pioneered in the work of the Catholic Information Centre there. She also served in Winslow, AZ, and for nearly ten years in the West Indies, both on the island of Carriacou and in Victoria, Grenada. Aside from time spent at Madonna House, Moncton, and Madonna House, Alpena, MI, the rest of her apostolic life was in Combermere, where her secretarial skills and her gift of hospitality enriched both members of the community and guests. Marite was predeceased by her parents, by her brother, Jean, and by her sister, Babette Brody of Barry’s Bay, ON. Marite will be waked Wednesday, March 27, with Visitation from 2 to 4 p.m. and 7 to 9 p.m. with a Wake Service at 8 p.m. at St. Mary’s Chapel, Madonna House. A Mass of Christian Burial will be celebrated at 11 a.m. Thursday, March 28 at St. Mary’s Chapel with internment following at the Madonna House cemetery. A reception will follow.